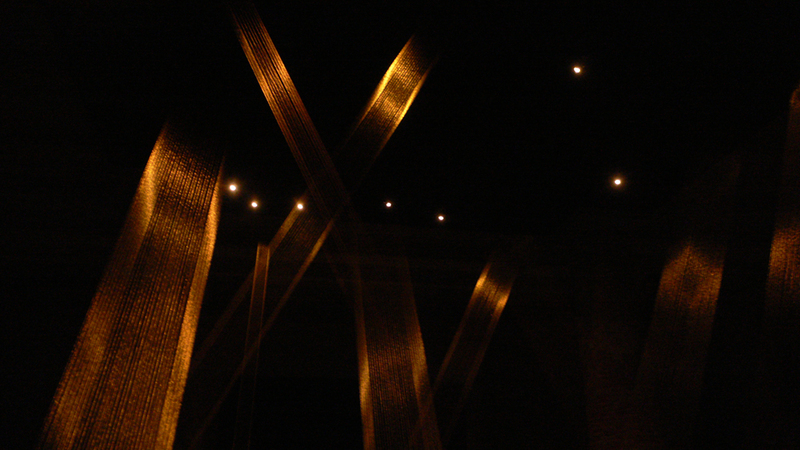 Perhaps it’s just my preoccupation of the week (or perhaps I’m desperate to make links here, no matter how tenuous), but seeing Lygia Pape’s beautiful installation of gold thread at the Serpentine Gallery put me in mind of a forest. The space is disrupted by thread that sparkles in the space rendering it unnavigable. The thread seems to form beams of light through the darkness, like sunlight penetrating a forest. Though the whole of Magnetized Space, Lygia Pape’s installation at the Serpentine Gallery, is fascinating and though this may be the only work I’ve seen in real life before, Ttéia 1, C is definitely the highlight for me. Standing looking at the work, I was entranced by the beams of thread in the darkness. Lost in the moment of the work in this permutation, it took a while for its familiarity to assert itself and I had to double check to be sure that it was this installation that I’d seen before (albeit that it inevitably changes to an extent for each space it exists in). Here in a darkened gallery space, the work is allowed uninterrupted by external factors. My previous experience of it, in Daniel Birnbaum’s Making Worlds exhibition at the 53rd Venice Biennale, was different in a way that highlights the impact of space on installation work. 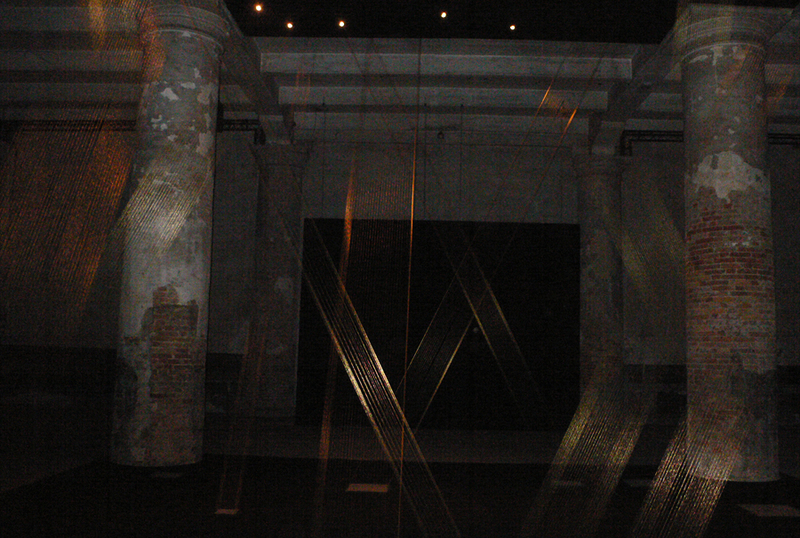 At the Arsenale, Ttéia 1, C was installed in a space which bore all the signs of a its origins. My reading of the work in the Serpentine Gallery as a forest made more sense there, amid the columns of the Arsenale. 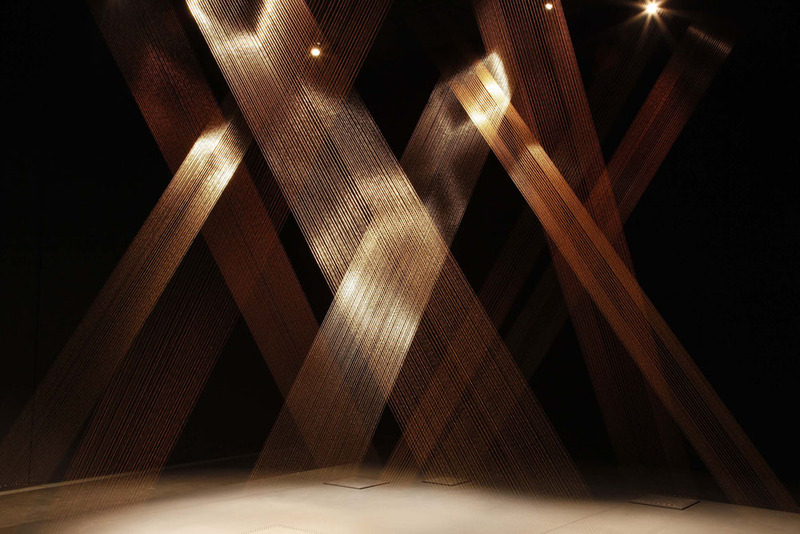 This entry was posted in Installation and tagged art, installation, Lygia Pape, Serpentine Gallery, thread, Ttéia, Web by Ann Jones. Bookmark the permalink.